Camelopardalis. © 2003 Torsten Bronger. 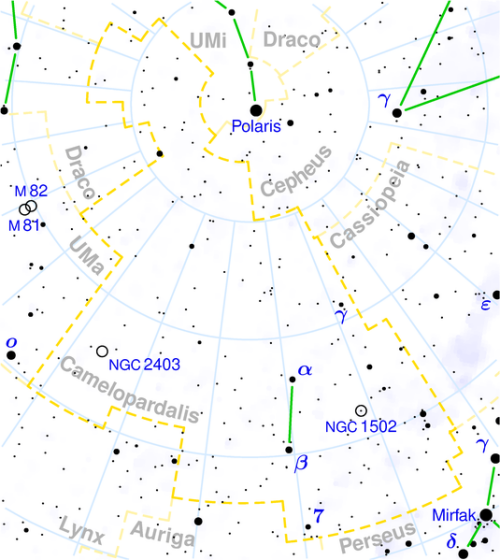 Camelopardalis (abbreviation: Cam), the Giraffe, is a large, relatively barren constellation near the north celestial pole, lying between Ursa Major and Cassiopeia. Only three of its stars, Beta, 7 Cam, and Alpha, reach fourth magnitude. Alpha is a notably remote and intrinsically luminous O star (visual magnitude 4.26, absolute magnitude -7.38, spectral type O9Ia, distance 6,940 light-years). See below for details of some of the constellation's interesting deep sky objects. NGC 2403 galaxy A spiral galaxy readily seen in small telescopes at low power and even visible with a good pair of binoculars as a hazy glow. In larger instruments it appears as a fat cigar-shape. It is an outlying member of the M81 Group. Magnitude 8.4; size 18' × 11'; distance 12 million light-years; R.A. 07h 37', Dec. 65° 36'.